I read somewhere that a couple who owned a Frank Lloyd Wright home but could no longer get along, refused to get a divorce because neither wanted to lose the house. It's funny how attached you can get to a house. When Bruce and Cindy Joldersma decided to downsize in Spring 2018 to a condominium in Holland near their grandchildren and their sailboat, it was a bittersweet decision. It required selling their right-sized David Post-designed modern house that stands out in a neighborhood of colonial, English Tudor and more traditional ranch homes. This house has been well-maintained. Although the window wall is original, it has been updated with newer glass doors, wood surround and a new glass transom. Against that wall is a lovely library style table with carved legs paired with modern plywood chairs, and on the east wall is a seating group facing a large shelving system displaying books and media. Opposite the windows is the interior full-height brick fireplace wall with cozy seating. The modern design aesthetic particularly appealed to Bruce, an artist who worked for Herman Miller as Director of Textile Design and Development, and taught classes at Grand Valley State University and Calvin College. He created the textile art on the fireplace wall and other works throughout the house. Cindy, like Bruce, has a natural affinity for modern design. She is a retired teacher and her family has bought its share of mid-century homes with a modern edge. 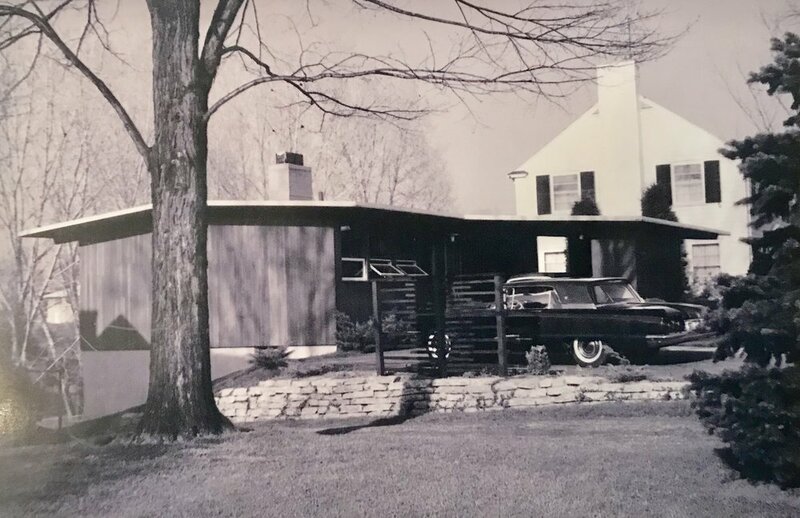 After Cindy was married, her parents moved into one of Grand Rapids early California-style ranch homes on Manhattan SE designed by popular builder James Bronkema. Her uncle, Edgar Boeve, headed up the first art department at Calvin College. Cindy and Bruce celebrated their wedding at her uncle’s home, another modern James Bronkema house on Fultonwood Drive SE, an enclave of six modern Bronkema homes and one Carl Koch pre-fabricated house. Bruce and Cindy love the scale of their house. However, when child number three was on the way in 1978, they decided to add on to the west side of the house to create a new formal entry and living room. Here the Joldersma’s collection of iconic Herman Miller furniture is artfully arranged including the Eames lounge chair and rare George Nelson brown leather sling sofa in the living room that is promised to their son after the sale of the house. Collectors that they are, they actually have a twin of this sofa saved for another son. When they completed the addition, they used the redwood paneling salvaged from the original west wall in the living room to match the rest of the house. They also extended the window wall and replaced the original balcony on the back of the house with an expansive deck. They then furnished the deck with multiple tables and comfortable outdoor furniture for the many gatherings they host for family and friends. David Post designed many Union Bank branches including one that won a commercial and industrial design award from the AIA Grand Valley Chapter. He owned a few of them as well. A partial list of Post’s buildings includes the IBM Building on Cherry Street, the Words of Hope Building on Ball NE, the Salvation Army’s Men’s Social Center on East Fulton and the Light-Metals Factory Building in Wyoming, Michigan. Post designed Hope Reformed Church, East Paris Christian Reformed Church, North Park Baptist Church, the Wesley Park United Methodist Church and the Grand Rapids Community College Learning Center. He also designed several Midwest department stores in Chicago and Minneapolis, and a Demery’s Department Store in Birmingham, Michigan. Post served on several community boards, and was President of the Board of Education, steering the school district through turbulent times when the Grand Rapids Schools was implementing school busing in the late 1960’s. Like the Posts, the Joldersma’s will now pass the home on to new owners. They hope to sell the house by spring 2018, and that, no doubt, will happen since the homes in this Maryland Estates neighborhood rarely even hit the market before they are sold by word of mouth. The ending to this story is really another beginning. 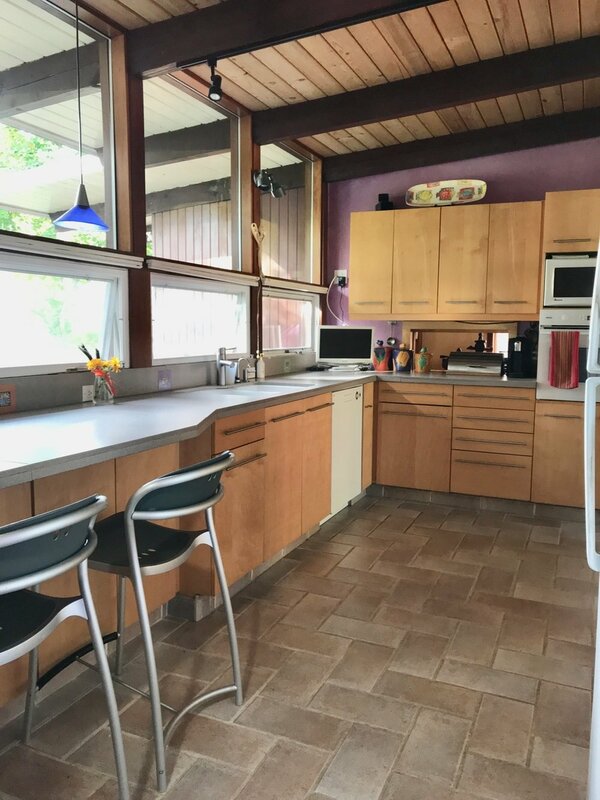 David Post, who designed the home, and the Joldersma’s, who nurtured it, could never have anticipated the intense interest and enthusiasm today for the mid-century modern style this home beautifully represents.